This despite unprecedented economic opportunities opening up for many women as a result of expanding global supply chains, equal rights for women in many countries’ constitutions, and widespread ratification of international labour standards including equal pay for work of equal value. It would be unfair to blame business alone for this state of affairs: discrimination reflects the norms prevalent in wider society. The scale and persistence of women’s economic inequality starkly illustrate the power of prevailing social norms, which discriminate against women. Such norms place inherently lesser value on the work women undertake, denigrate and deny women’s role in decision-making, and curtail women’s opportunities to fulfil their potential and realise their rights throughout their lives. Discrimination against women occurs at every level of society, from institutions at local to global level, and within the social, cultural, political and economic spheres. It has led to an economic order that systematically exploits women, and one that is further confounded by flawed economic policies and corporate practices that depend upon the subsidy of women’s cheap labour to boost profits, economies and GDP. This labour includes the hugely disproportionate amount of care work women are expected to undertake – caring for children, the sick and the elderly, preparing food and fetching water – so vital to our social fabric and for healthy workforces. Such care work is all the more demanding in contexts of poverty, while further curtailing women’s opportunities to secure regular, decent work. As a result, women constitute some 60% of the world’s working poor. They are vastly over-represented in the lowest paid, precarious jobs, enduring degrading working and living conditions, with little access to social protection or to justice where rights violations occur. Such a system is both unjust and socially and economically unsustainable, not least because businesses are missing a huge pool of potential talent by under-employing and underinvesting in half of their workers. The ILO estimates that an additional $1.6 trillion could be generated in global output by reducing the employment gap between women and men, which could help eradicate poverty and drive prosperity for all. Businesses, whether small companies or multinationals with supply chains spanning continents - do not operate in a vacuum. They are situated within societies and, as such, tend to reflect and reinforce prevailing social norms, which combine with harmful economic policies and further drive women to the bottom of the pile. So what should business do? Following national laws is the first step and most countries (but by certainly not all - around 90% still have at least one law restricting women economically,) outlaw overt discriminatory practices relating to recruitment and pay. However, discrimination is much more subtle and pervades every society at every level. Women are vastly underrepresented in the Board Room in every country, despite evidence showing that the financial returns for companies with three or more women on their boards are better than those lacking women at the top. And women were again a small minority on panels at the World Economic Forum in Davos last week. Changing such patterns of behaviour requires much greater awareness and action by both men and women – as the “No thanks to all male panels” campaigns in Norway, Sweden and Australia have been demonstrating. Businesses can also introduce policies to help redress the balance, such as offering flexible work and shared parental leave to allow women and men to balance caring responsibilities, and pay their taxes to pay for public services, so vital to reducing the burden of care. 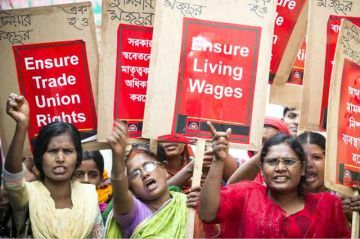 They can seek to ensure women working in their supply chains have secure contracts, earn a living wage, are entitled to maternity leave and sick pay, and – vitally – have the right to engage in collective bargaining to help safeguard their rights. Another issue which is perhaps less common in the boardroom but much more prevalent in supply chains is that of sexual violence. Human Rights Watch has estimated that many thousands of women have been abused in the US agricultural sector – many of them migrant workers and many of the cases unreported. Sexual violence is endemic in agriculture in many parts of the world, as cases in India and East Africa suggest. Indeed, violence against women in the world of work, including sexual violence, is so widespread across so many sectors that the ILO and trade unions are pushing for a new ILO Convention on Gender Based Violence. The approach taken by business needs to be one of due diligence: preventing and mitigating abuse and discrimination as much as possible but also providing adequate remedies when harm has occurred, and cooperating fully with legal cases which attempt to give victims redress for harm done. But there is one game-changer that should not be overlooked. Businesses still tend to wait until they find evidence of discrimination or abuse before acting. This often means abuse goes undiscovered and underreported. Widespread discrimination against women in a society is likely also to be found in the workplace. If it is known that women workers are particularly vulnerable to exploitation - be it in agriculture, domestic work or the apparel sector - then businesses should not wait for evidence before taking action. Cases suggest that in countries where abuse is most endemic, women are least likely to report abuse to the company, often fearing repercussions if they do or lacking faith that the business can actually do much about it. So corporate human rights due diligence in relation to a known risk such as gender-based discrimination means being proactive and using all available leverage to increase transparency and accountability of risk-factors. Businesses that do not act will one day find themselves in court, but long before that their social license should be challenged by women and men everywhere. Business is clearly an important actor, but it is not the only one. Some of the worst discrimination is in the informal sector or the home. Transforming the status quo requires communities, civil society and government to act to change societal norms, to rethink economic policies, strengthen legislation, ensure its effective implementation to create a level playing field for all, and ensure proper accountability mechanisms. Women can be a powerful force for change as has been shown countless times. They just need business to get on board.